People who use the WhatsApp will agree that it has the potentials of eating too much of space on your iPhone. Therefore you may want to erase WhatsApp due to the following reasons. Delete WhatsApp attachment: Deleting attachments like media files on WhatsApp on your iPhone are important because it helps you save a whole lot of space which might have caused some problems like slowing your speed etc on your device. Erase Text Info: There are also some privacy concerns in WhatsApp conversation and this could be another reason to erase iPhone WhatsApp which is to erase text information that could contain some private vital information. You can delete all tracks of WhatsApp, text messages, voice messages, chat history etc on your iPhone manually and it is not hard. For example, due to some reasons, you may be interested in deleting the all WhatsApp message history which includes the ones that were received and sent, or you may want to delete individual chat history in WhatsApp. However, whatever the option, WhatsApp can allow you do that with the following simple steps. Step 1: First launch the WhatsApp app on your iPhone and then go to Chats. Step 2: Then go to Edit seen on the top from the left corner. Step 3: Next is to tap the delete button. Step 4: Enter WhatsApp number and tap “Delete All Chat”. You can also clear the entire WhatsApp chat history all at once on your iPhone with these steps. Step 1: Launch the WhatsApp app on your iPhone. Step 2: Go to Settings found on the bottom. Step 3: Scroll down and find “Clear All Chats”. Step 4: Then enter WhatsApp number and clear all chats. These few steps will clear all the chat history cleared. However, it's important to note that all deleted files by the process above can be recovered with a data recovery tool Your private data is not protected. Like mentioned earlier, it is important to note that manually-deleted files can be recovered, but if you want to wipe iPhone WhatsApp track (messages and attachments) permanently, you can use iMyFone WhatsApp Eraser or iMyFone WhatsApp Eraser for Mac. This software is an all-in-one solution for your iPhone space saving and privacy protection. 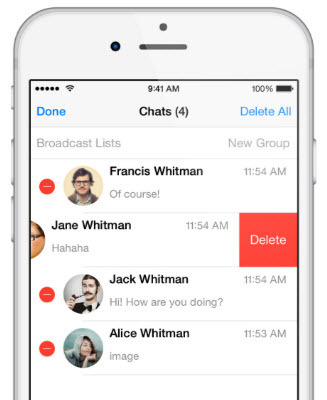 Preview and completely wipe WhatsApp chats & messages, 100% unrecoverable. Select WhatsApp media to be completely removed from iPhone. Totally clear all private traces left by WhatsApp, Snapchat, Facebook, Kik, etc. Clear WhatsApp cache and all app cache at once for free. 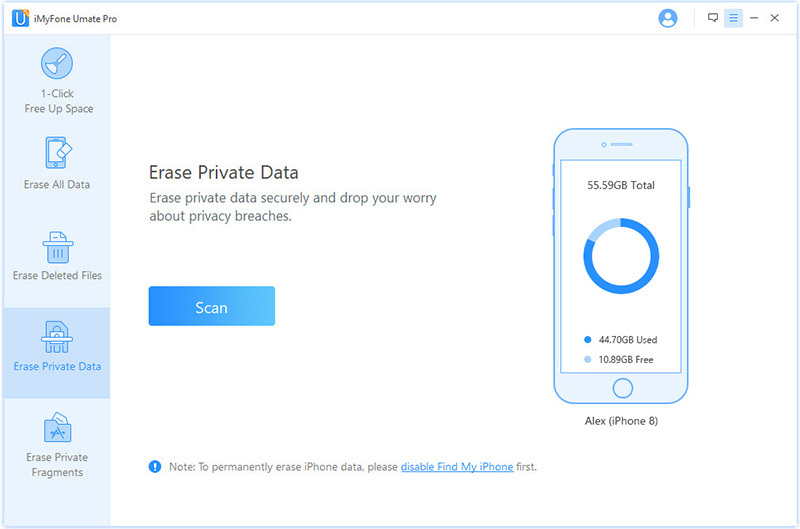 Erase previously deleted files: browsing history, contacts, call logs, photos, videos, WhatsApp, voice memo, etc. iMyFone WhatsApp Eraser (Umate Pro) received lots of high comment by famous media, including APPKED, MacWorld, iPhoneinCanada, etc. Step 1: Connect your iPhone to computer and run iMyFone WhatsApp Eraser. Step 2: Select any Erase mode you want to use. Then Scan your iPhone. Step 3: Select the WhatsApp files that you want to erase, and click on "Erase Now" button to erase your WhatsApp permanently. Umate pro also have the function of 1-Click Cleanup, it offers you the opportunity to clean up your device in just one click. 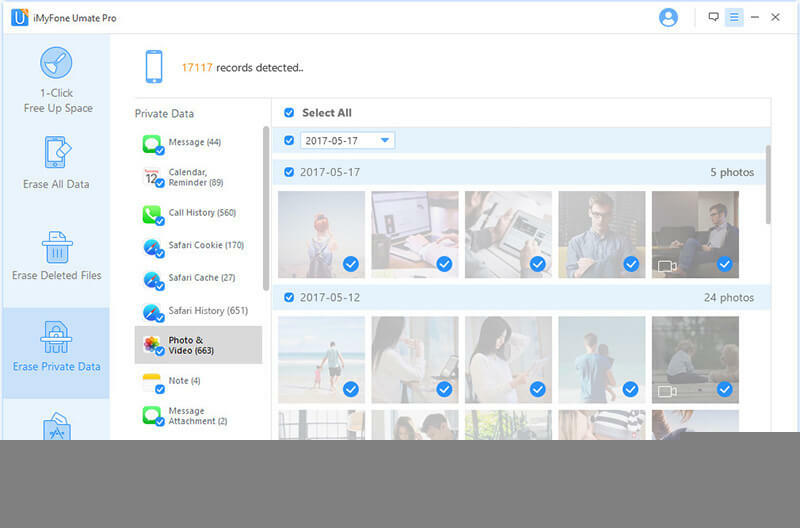 With it, you can easily remove temporary files, manage apps, delete or compress photos, mass delete videos etc. This can help you manage space better and ensure your device performs at optimal speeds. But the files deleted in this mode, can be recovered by recovery tools.